Serving the Lord by providing better vision to people of underdeveloped countries. With primary emphasis in underdeveloped countries, Kendall Optometry Ministry, Inc. was established in 2003 to spread the Word of our Lord and Savior Jesus Christ. This is accomplished by providing glasses to improve the vision of people living in many underdeveloped countries. These impoverished people can now see to read their Bible, and also improve their standard of living. Kendall Optometry Ministry, Inc (KOM) is a 501-3c non-profit organization formed to provide optical equipment and training to Christian optical mission teams traveling all over the world. The equipment and training is provided at no cost and supplies are provided at a break even price. Teams are responsible for building their own eyeglasses inventory but much assistance (in the form of training and software) is provided by KOM to assist in the building of this inventory. KOM also has a limited supply of barcoded glasses (prescription in barcode) which can be used to quickly build an inventory. A testimonial by the President. I was raised in a Christian family. My father, M. H. Kendall, was a college professor and head of the religion department at Mars Hill College, Mars Hill, N.C. for nearly 40 years. I worked for 29 years for General Electric Appliances in Louisville, Ky. During the last 4 years I averaged several hundred thousand miles each year on international travel installing computer systems. All of this travel went flawlessly. God blessed me in everything that I did. It was something that I found to be obvious that God had a hand in my work. 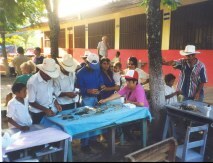 In July, 1999 I decided I would take one mission trip to Honduras working through an organization called "Baptist Medical Dental Mission International" (BMDMI.ORG). My intent was to "pay back the Lord" with this one mission trip. When I arrived in the village, I asked the team leader what he wanted me to do. He said he had several boxes of used prescription glasses to hand out. These glasses were dirty, broken, and not measured. As you can see in Figure 1 to the left, we just set them out on a table and people came by and tried them on until something helped them. I immediately knew this was wrong but it was the best we could do then. I came back from that trip with a God Given passion to do it better. Since 1999 I have gone to Honduras 14 times. Each time something would be improved. 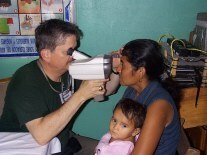 The use of the autorefractor was introduced into Honduras in 2003 (see Figure 2) and another one into Nicaragua in 2004. 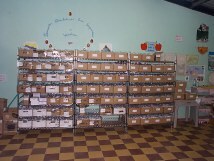 A special series of computer programs were developed to manage and build the inventory. You can review these programs at http://eyeglasses-Inventory.com/. Since 2003 of the 51 BMDMI mission teams more than 90% of these teams use the equipment and software developed by Kendall Optometry Ministry, Inc. In 2003 Kendall Optometry Ministry was incorporated as a 501-3c non-profit company. Using donations provided by several churches and individuals this company purchased a 3rd set of equipment which could be loaned out to Christian mission teams going all over the world. The teams would use this equipment to not only allow people to read their Bible but to also to help them improve their standard of living. You can read about some of these teams in the About Us area of this web site.